A clogged dryer vent will cause your dryer to run hotter and can contribute (along with other factors) to causing a fire. Fire hazards are exaggerated but many fire departments and insurance companies require regular inspections and cleanings. Most vents need cleaning every two to three years depending on factors such as vent length, number of bends and turns in the vent, and the size and age of your dryer. Routine Cleaning Your dryer vents are cleaned from the outside using a special, high pressure, compressed air tool. 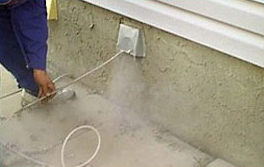 This tool "drills" through your vent loosening lint, debris, and animal nests. We collect this waste for disposal. This tool typically cleans up to the flexible hose behind your dryer. No lint or dirt enters your dryer or home. Problem Cleaning Problem cleaning is done when the dryer is no performing as it should, typically it is not drying clothes as fast as it normally does. We disconnect the dryer, and using a large blower on the vent we try to blow loose nay debris. Depending on the build up we may need to utilize a brush and vacuum as well.